University Park, IL—(ENEWSPF)–February 28, 2017– You might think it difficult to find ways to relate jazz music to the visual arts, but really there are many connections—obsession, improvisation and collaboration. Explore these principles in artmaking at Governors State University’s Visual Arts Gallery on March 10 from 5 to 7 p.m. at the opening of “Obsession+Improvisation+Collaboration,” an exhibit inspired by the traditions and practices of Jazz music. 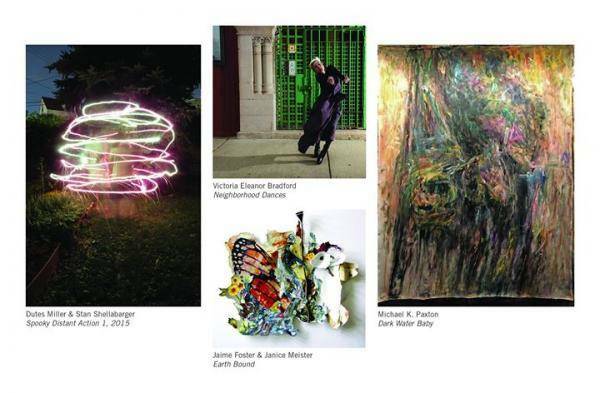 The exhibit is free of charge and features the work of six Chicago-based artists: Victoria Bradford, Jan Meister & Jaime Foster, Dutes Miller & Stan Shellabarger and Michael K. Paxton. As part of the Southland Arts Municipalities and Business Alliance (S.A.M.B.A. ), the Visual Arts Gallery at GSU is taking part in the Chicago Southland’s “Let Them Eat Jazz” festival, a multi-month celebration of jazz commemorating the 100-year birthday of many jazz icons. S.A.M.B.A. is a newly formed arts and business collaboration, designed to showcase the power of the arts to drive people to the Southland region. Artists were chosen specifically to showcase obsessive qualities in their art making practices, improvisation that pushes the boundaries of their work, and collaboration as a significant part of their primary art making practices. Dutes Miller and Stan Shellabarger have a collaborative practice that explores physicality, duality, time and human relationships through the lens’ of togetherness and separation, private and public, visibility and invisibility, and vulnerability and pain. They will perform their signature performance, “Untitled (Pink Tube),” a non-theatrical, durational piece, where they simultaneously crochet at opposite ends of a long tube of pink acrylic yarn. In contrast to this, the collaborative work of Janice Meister and Jaime Foster is a new development between these artists and symbolically assembles abstract designs, shapes and debris in concise, collage pieces. One of the strongest connections between all of the artwork in the exhibit is the reference to movement of human beings. The cathartic paintings of Michael K. Paxton demonstrate mark making on raw, unstretched canvases that imply the energy of a body in motion, arms waving, legs lunging, and metaphoric dance; also captured by Victoria Eleanor Bradford in this exhibition through photography and video of daily micro-dances recorded on iPhone and distributed through social media. The movements of the “Neighborhood Dances” by Bradford are echoed once again in “Spooky Distant Action 1” a photographic representation of sparklers put in motion by Miller/Shellabarger. For more information, contact Jeff Stevenson, Director, GSU Art Gallery at [email protected] or visit the web site at www.govst.edu/gallery. For a complete schedule of jazz-inspired events, visit http://CSJazzFestival.org. Thank you to our sponsors BMO Harris Bank, Standard Bank and Providence Bank & Trust.